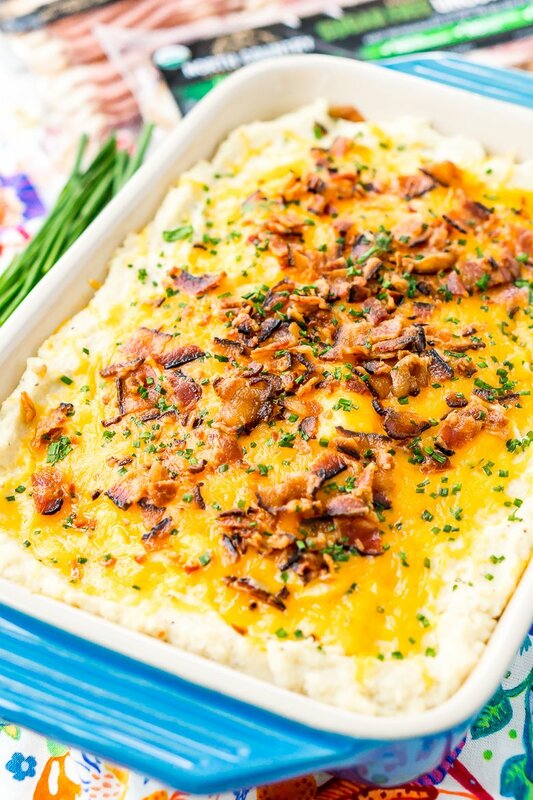 This Loaded Cauliflower Casserole is a sponsored post on behalf of North Country Smokehouse. 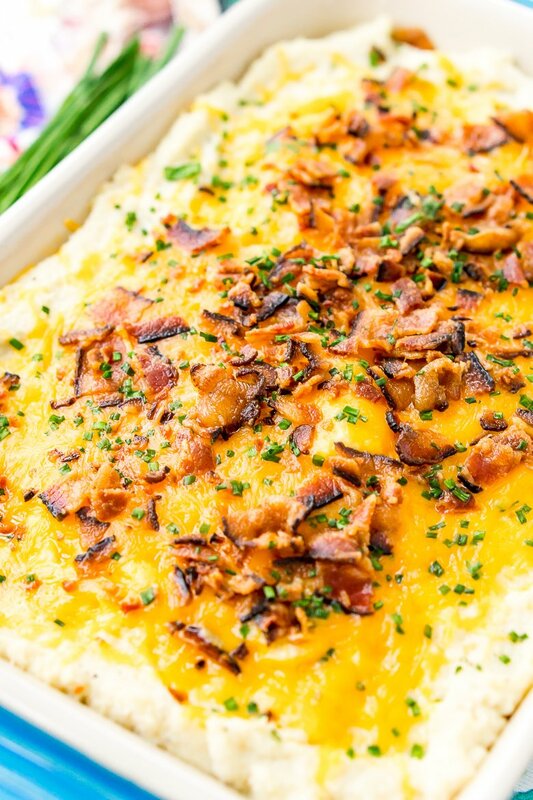 Loaded Cauliflower Casserole is an easy and delicious low carb and keto-friendly side dish loaded with bacon, cheddar cheese, sour cream, garlic, and more! If you’re a low-carb or Keto dieter, this Loaded Cauliflower Mashed Potatoes recipe is going to change your life. What’s more, you’ll be able to enjoy your holiday feasts without feeling deprived at all! This Cauliflower Casserole definitely doesn’t taste like “diet food.” That means that everyone at the table can enjoy it … although, you’ll want to keep it all to yourself. JUST TAKE ME TO THE LOADED CAULIFLOWER CASSEROLE RECIPE ALREADY! If you’d rather skip my (very helpful, I think) tips and tricks, essential cooking info, and similar recipe ideas – and get straight to this deliciously easy Best Ever LOADED CAULIFLOWER CASSEROLE Recipe – simply scroll to the bottom of the page where you can find the printable recipe card. The low-carb secret in this recipe is replacing starchy potatoes with cauliflower. If you haven’t tried this substitution before, you’ll be amazed at how the taste and texture are spot-on! 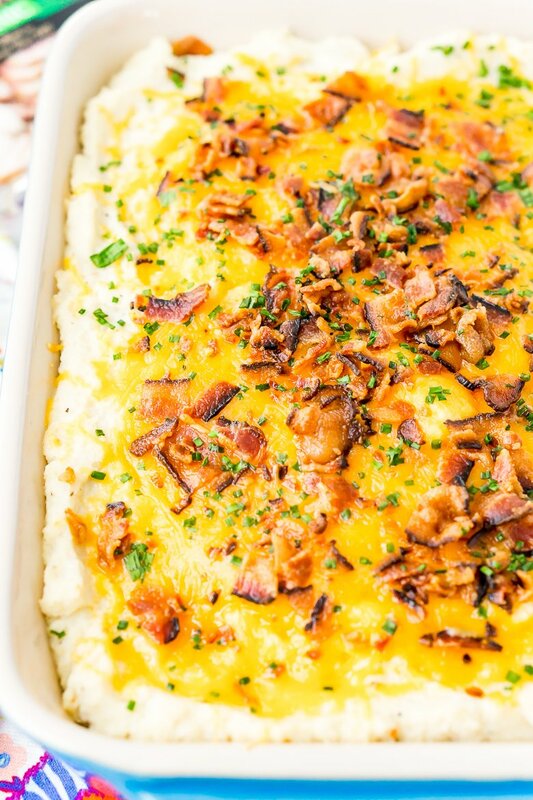 Not to mention, a key ingredient in these Cauliflower Mashed Potatoes is bacon. As we know, bacon makes everything better. 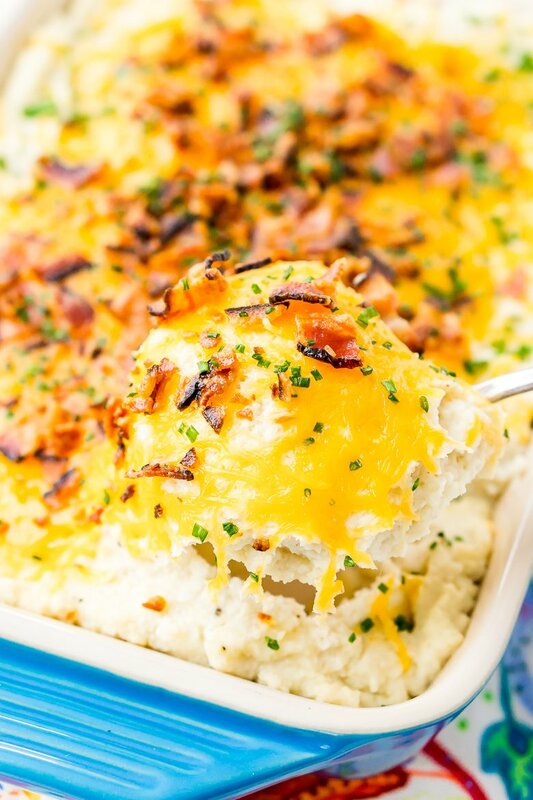 This Loaded Cauliflower Casserole is made with cauliflower that’s steamed, then mashed smooth. Sour cream, butter, and cheddar cheese make this dish extra rich and creamy. The addition of chives, garlic, onion, salt, pepper, and a pinch of cayenne add the perfect amount of zing. Then comes the finishing touch: crumbles of applewood smoked bacon! 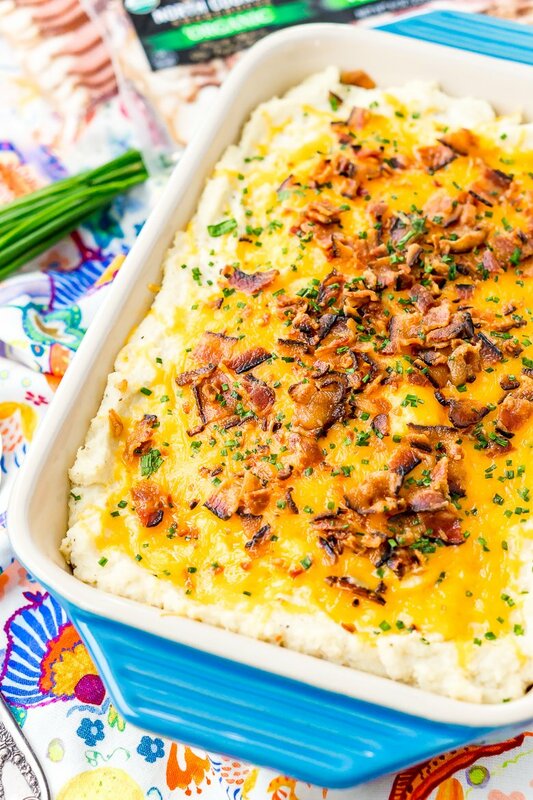 This Cauliflower Casserole takes a little over an hour to make and it’s twice baked! It’s not an overly complicated recipe but it does require a few steps to get the cauliflower from florets to “mashed”. Begin by preheating the oven to 350 degrees F.
Cut the cauliflower into florets, slicing any large florets into smaller pieces. Add the florets to a large bowl with the olive oil, and 1/2 teaspoon each of salt and pepper and toss to coat. Transfer the cauliflower to a large baking sheet and bake for 35 to 40 minutes, tossing halfway through and cooking until fork-tender. Leave the oven on when you take out the roasted cauliflower. While the cauliflower is roasting, cook the bacon in a skillet on the stove until your reach desired crispiness, transfer to a plate and let sit for a couple of minutes before chopping up into pieces. When you remove the cauliflower from the oven, transfer it to a blender or food processor and blend the cauliflower to break down the florets. Add in the sour cream, heavy cream, butter, and remaining spices. Blend until the mixture resembles mashed potatoes. 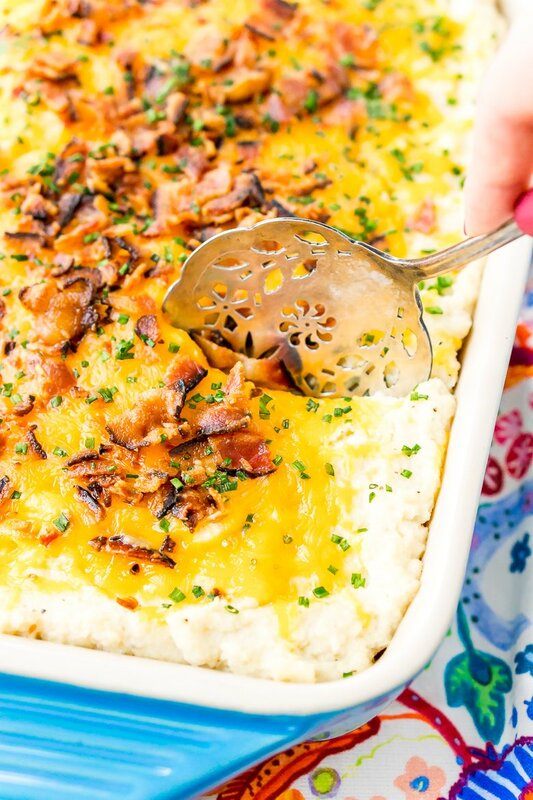 Transfer to a casserole dish and top with cheddar cheese, bacon, and chives and bake for 20 minutes. I prefer to roast my cauliflower instead of steam or boil, this adds an extra layer of flavor and you don’t need to mess around with squeezing water out of the cauliflower. Unfortunately, because I do roast the cauliflower, this means it takes longer to prepare this dish as the roasting takes about 30 to 40 minutes, but at least it’s mostly hands-off time so you can cook your bacon or do something else. 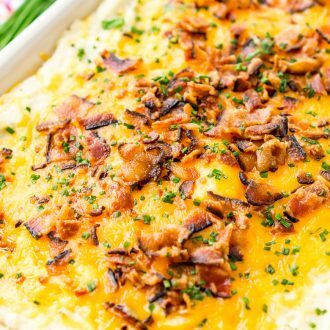 If you want to make Loaded Cauliflower Mashed Potatoes, simply reheat the cauliflower after adding in the dairy and spices, then stir in your cheese, bacon, and chives and serve in a bowl instead of baking for the second time. If you (or some of your guests) are on a low-carb or Keto diet, the ingredient in this recipe that could throw off their hard work is the bacon. That’s because — believe it or not — a lot of commercial bacon brands add sugar to their products. And as you probably know, sugar is (sadly) usually avoided on these diets. This low-carb cauliflower casserole has just 5 net carbs per serving and is a delicious way to indulge in your veggies! Sugar-Free Bacon is Keto, Paleo, and Whole 30 Friendly! But there’s good news: you can enjoy your bacon without sugar if you choose the right kind! 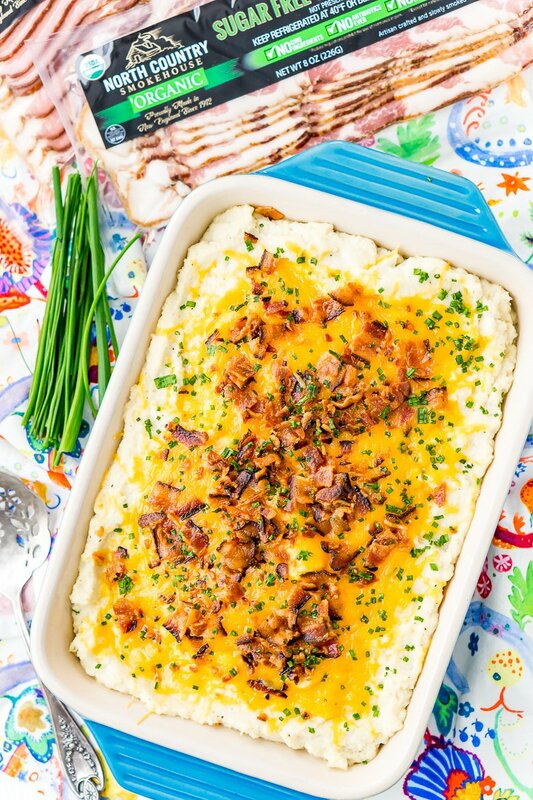 That’s why I use North Country Smokehouse Sugar-Free Bacon in this Loaded Cauliflower Casserole, which is made to share. 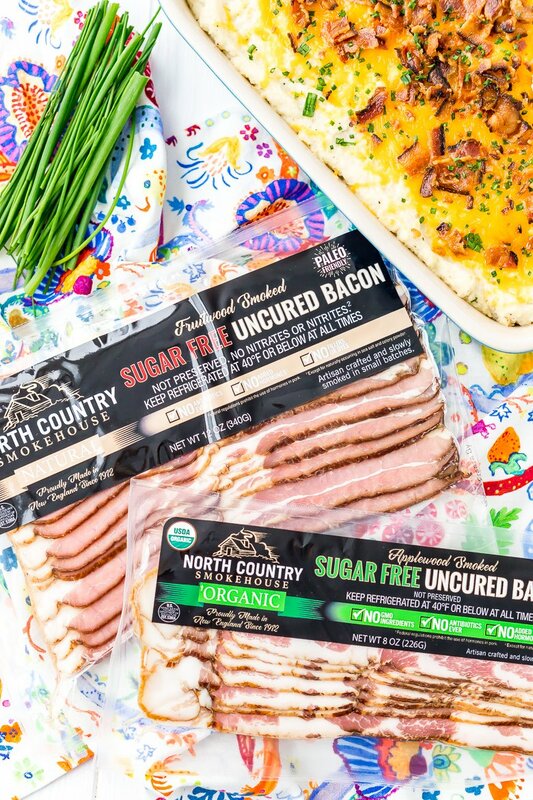 North Country Smokehouse bacon has all the delicious flavor you want in each crispy, smoky strip, without the unnecessary sugar. Instead, it’s slowly smoked for over 10 hours, infusing it with mouthwatering flavor the old-fashioned way. 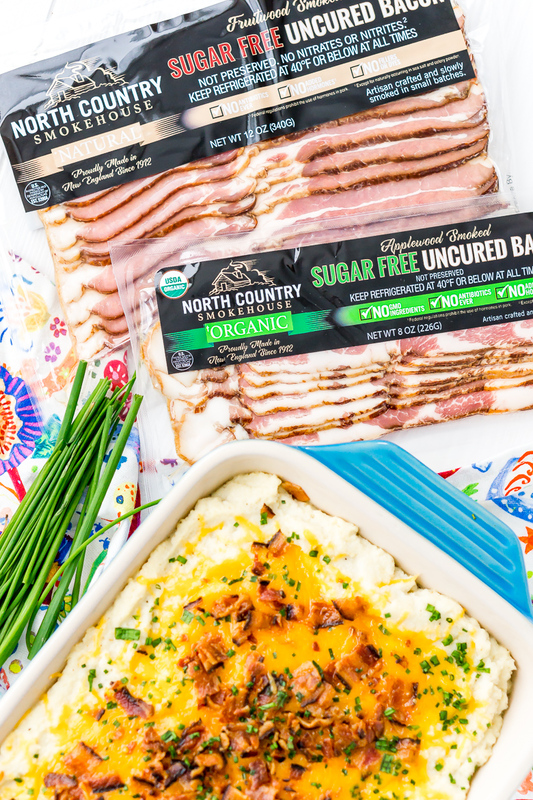 Without sugar, North Country Smokehouse bacon is a great option for people on the Paleo and Whole 30 diets, too! I specifically use this brand when I’m cooking for guests who eat low-carb. But I also buy this stuff to enjoy myself because there are a few things I really love about it. First of all, these products are Certified Humane, meaning the company adheres to strict animal welfare standards. The farms are inspected by a third party to ensure that the livestock has shelter, room to roam, and can engage in natural behaviors. Second, this bacon is made without antibiotics, sodium nitrates or nitrites, or added growth hormones. Third, the company is based in Claremont, New Hampshire, and I like supporting local New England businesses. In fact, North Country Smokehouse is one of the last remaining family-owned smokehouses in America. Then, of course, is that fact that their bold bacon flavors are totally delicious! Choose from All-natural Fruitwood Smoked or Organic Applewood Smoked varieties; the latter is non-GMO and made with vegetarian-fed pigs. It’s no wonder that this bacon has been recognized by top magazines. North Country Smokehouse was deemed to have “New England’s Best Meat” by Yankee Magazine and the “Best Bacon in America” by Food & Wine. Even Men’s Journal put it on their “America’s Top 10 Best Bacons” list … and they know their bacon! If you’re wondering where to buy North Country Smokehouse products, you’re in luck. You won’t have to go far because they’re carried by Hannaford Supermarket, Whole Foods Market, Big Y, and Stop & Shop. You can also order both varieties online at ncsmokehouse.com. Needless to say, this bacon is perfect for everything from your weekday breakfasts to your Thanksgiving and Christmas recipes. If you plan on whipping up a Loaded Cauliflower Casserole, this ingredient totally makes the dish! When it comes to eating with loved ones, I like knowing there’s something on the table for everyone to enjoy. After all, coming together and sharing food is what the holidays are all about. Transfer the cauliflower to a large baking sheet and bake for 35 to 40 minutes, tossing halfway through and cooking until fork-tender. Leave oven on. Remove from oven and transfer to a blender or food processor and blend the cauliflower to break down the florets. Add in the sour cream, heavy cream, butter, and remaining spices. Blend until the mixture resembles mashed potatoes.